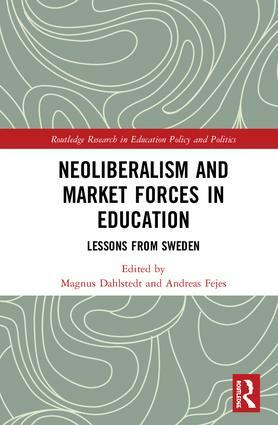 Neoliberalism and Market Forces in Education provides a wide perspective on the dramatic transformation of education policy in Sweden that has taken place during the last 30 years, with a specific focus on marketization. The marketization of education in Sweden is set in the wider international context of changes in education systems. With contributions from researchers across a wide range of scientific disciplines, the book provides examples of the consequences of market orientation in education in terms of increase in inequality as well as in terms of what the market orientation means for principals, teachers and students. It considers how Sweden has developed one of the most marketized education systems in the world and the possible consequences of such processes, as identified by research. Neoliberalism and Market Forces in Education will be of great interest to educational practitioners, politicians, scholars in the field, and postgraduate and research students in education. "Too much is said about neoliberalism in general and not enough about neoliberalism in particular. This collection of papers deals with both in relation to Sweden. The reader gets a real sense of moments, structures and processes of neoliberalisation. Together the papers offer of subtle, insightful and potent analysis of a country once renowned for its equity and welfare being remade by the values and social relations of neoliberalism. We should all read this, we may be next!" Stephen J Ball, Distinguished Service Professor of Sociology of Education, Institute of Education, University College London. Chapter 10: A stimulating competition in the upper secondary school market? Magnus Dahlstedt is Professor of Social Work at Linköping University in Sweden. His research interests concern citizenship in times of migration, market orientation, welfare and social policy changes, and democracy. Andreas Fejes is Professor and Chair of Adult Education Research at Linköping University in Sweden. His research interests concern the marketization of adult education; migration, learning and social inclusion; citizenship education; and bibliometric studies in education.